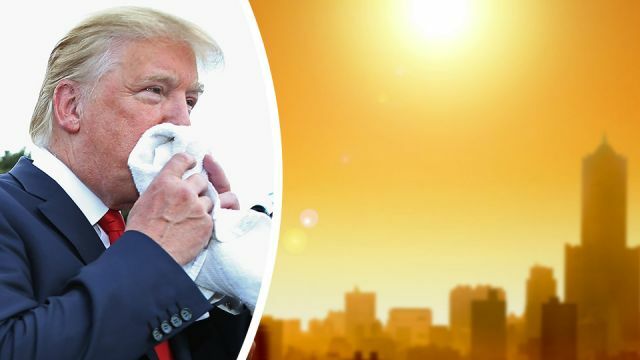 A new scientific report published by the U.S. government Friday concludes that human activity is the main driver of climate change, something that has unbelievably contradicted The Trump Administration’s past stance and many prior statements released by the President. NPR- It is “extremely likely” that human activities are the “dominant cause” of global warming, according to the most comprehensive study ever of climate science by U.S. government researchers.The climate report, obtained by NPR, notes that the past 115 years are “the warmest in the history of modern civilization.” The global average temperature has increased by about 1.8 degrees Fahrenheit over that period. Greenhouse gases from industry and agriculture are by far the biggest contributor to warming. The findings contradict statements by President Trump and many of his Cabinet members, who have openly questioned the role humans play in changing the climate. The report states that the global climate will continue to warm. How much, it says, “will depend primarily on the amount of greenhouse gases (especially carbon dioxide) emitted globally.” Without major reductions in emissions, it says, the increase in annual average global temperature could reach 9 degrees Fahrenheit relative to pre-industrial times. Efforts to reduce emissions, it says, would slow the rate of warming. Some of the clearest effects involve sea level rise. “Coastal flooding, you raise the mean level of the ocean, everything else equal you get more coastal flooding,” Alley says. The report notes that sea level has risen 7 to 8 inches since 1900, and 3 inches of that occurred since 1993. The report says that rate is faster than during any century over the past 2,800 years. Alley adds that the new report “does a better job of seeing the human fingerprint in what’s happening.” He says that while he hasn’t read all of it yet, he sees no evidence that it has been soft-pedaled or understates the certainty of the science. WOW, after reading this new report, I was very surprised. It now seems like the Trump administration is taking the threat of climate change far more seriously, which is a good thing. Growing up in the 21st century, I was always taught in school that “global warming” was a serious threat, but no one, including my teachers or professors, had any ideas of trying to stop the many disastrous problems it has been creating across the globe. Especially now, the evidence seems almost unarguable that it is affecting the planet in a serious and troubling way. While I agree that I think China has definitely taken advantage and abused many climate change regulations, I was always confused by what he meant by the tweet, especially since most climate change statistics are pretty hard to disbelieve. In other words, I just didn’t think Trump could defend himself on this topic and that his political opponents were going to eat him alive for once saying it. I must admit that I also think the threat of climate change has been overblown by some people, like Vice President Al Gore, who once said that the world was going to end in coming years. I think everyone from every political spectrum can agree that they want to see a cleaner planet. To actually want the planet to crumble is just a completely unwinnable and naive argument. In other words, you have to be crazy to actually think that. As an American, I want our nation’s leaders and top scientists to figure out the very complex problem of stopping climate change’s empirically proven problems like rising sea levels and higher temperatures in a smart and cost-effective way. Personally, I’ll drive a Prius and eat more environmentally healthier foods if it means saving our o-zone and stopping some of the other terrible problems. When you have other countries like India and China really contributing to the problem of climate change like the United States, it clearly makes the problem a lot hard to solve, especially since there are many other problems in those countries which pose a much more imminent and dangerous threat, like over-population. That being said, I think this statement released by the Trump Administration is very promising and a step in the right direction. If all people can finally agree that climate change is a problem, then we can all start moving towards the best possible solution. BREAKING: Trump administration releases report finding ‘NO convincing alternative explanation’ for climate change!! There is no "other side" to science? Climate Change evidence needs to be taken in it's entirety and not edited to form a false narrative. Although I am relatively young, I don’t want to see future generations living in a very contaminated and grimy planet. It’s time we hold more people accountable and start doing what is right for everybody, not just those that benefit at the expense of others. Hey Buddy!, I found this information for you: "Breaking: Trump Administration Releases New Climate Change Stance". Here is the website link: https://www.thealternativedaily.com/Trump_Administration_Releases_New_Climate_Change_Stance. Thank you.